...De Palma addressed this comedic lack when he appeared at the Edinburgh Film Festival: after averring that he wasn’t afraid of anything, he admitted that he probably wouldn’t be making any more comedies anytime soon. And yet he practically began as a comedy director: that’s one word used to describe Greetings and Hi Mom! 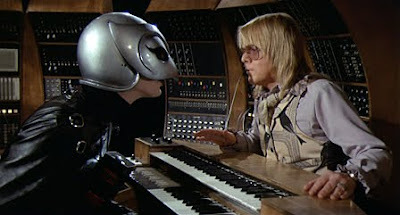 anyway, and then there’s the Tom Smothers movie and Phantom [of the Paradise]. I think maybe De Palma’s sense of humour is a little too outre for popular taste, like Polanski’s, and his technique doesn’t really lend itself to chuckles — I can recall a 360 degree pan in Wise Guys, and it didn’t really work as a gag-delivery mechanism. Plus Polanski and De Palma can’t help throw in unpleasant little details that make the laughter shrivel in your throat — here there’s a gratuitous tooth-pulling episode that leaves the Phantom with a ritzy set of steel gnashers. He doesn’t USE them, but there they are... Read more here. Just two more days, so keep those submissions/contributions coming.